I’ve teamed up with some blogger friends to bring you a giveaway with an amazing prize. 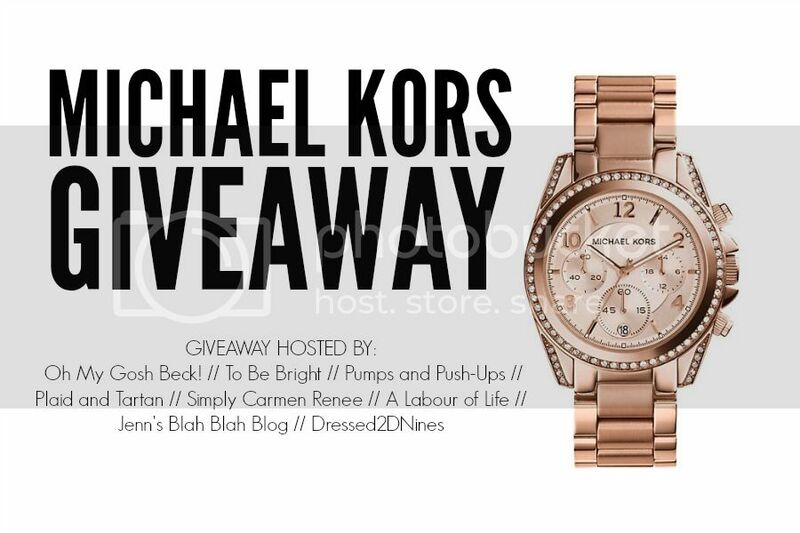 We’re giving away a $300 Michael Kors gift card to one lucky winner… and it just might be you! You can enter daily over the next two weeks and earn bonus entries by sharing the giveaway with your friends on social media. Good luck! Rules: Use the Rafflecopter form to enter daily. Giveaway ends 11/24 and is open worldwide. I would definitely purchase a watch. I love MK watches! I am definitely needing purse. I really like Michael Kor's totes. I would totally buy a bag if I won. What a great prize! Oh, gosh, I would buy a purse! I need a new one desperately. I would purchase the Jules Drawstring Leather Large Shoulder Bag! The leather looks so soft and buttery, and I love the color. A tote from the new line. I love the new colors. Today I'm eyeing the new Hunger Stop watches. I love the map on the face! I would def buy the MK silver watch that I've been watching on ebay for about a year lol. It's the one that says MK in big letters on the face.... Love it! Thanks! I thought I wanted the watch but now I really love the purse shown on laceandglaze IG acct! One item I would purchase would be the Daisy Metallic Leather Moccasin from Michael Kors. I love the gunmetal color. What a great giveaway! I definitely want to enter! Most likely a purse - I can never hve too many! There is no doubt here - I am in dire need of a new handbag, so that'll be it! I'd love the Kempton Small Tote & a new wallet! Oooh, awesome giveaway! I'd buy a purse! A plum purse or a silver watch! I love the silver watch with the big MK on the face! I'd buy a purse. Thanks! Item for today would be a holiday clutch! I looked it up and the bag that I love is the Suttin Medium Saffiano Leather Satchel in raspberry! Gosh it's so gorgeous! I'd get a rose gold watch! I would buy a watch! My heart beats for the Suttin Medium Saffiano Leather Satchel in raspberry! Probably the one that is in the pic! Could really use a new watch! I would get the Logo Charm Saffiano Moccasin and the Jet Set Chain Shoulder Bag. I'd get the watch I've been drooling over forever! this would so go toward the watch or raspberry colored purse that i've been dying for! They have such nice watches! I'd get the MK poncho I saw featured on a blog - it's so gorgeous! A watch - I've wanted one for years! I have wanted a MK watch that has the big MK on the face of it for the past year! I would so put it toward one of those! Either a gorgeous watch or shoes! Or I may even give the gift card to my mom for Christmas! Maybe I'd get a sweater and a watch! I would either get a sweater or a jacket! I really need a new winter jacket! Ive wanted a MK watch for about a year so def a watch! the raspberry purse i like is nice too! SO many gorgeous watches.. how could I resist one of those beauties!